Supporting independent and low budget horror. The Lodgers is about a sinister family curse that keeps two orphaned twins, Rachel and Edward, confined to their families crumbling estate. When Rachel falls in love with a boy from the nearby village, she decides to take action and break the curse once and for all with deadly consequences. The Lodgers is a haunting and beautifully filmed Gothic thriller featuring a dark family history that links each generation together like a cursed chain. The orphans live by themselves in the house but they are not alone and the film lets the viewer know early on that the ghosts are running the show. The ghosts of the previous generations watch over the next from the watery grave that lay just below the house. There are three rules that Rachel (Charlotte Vega) and Edward (Bill Milner) must live by: be in bed by midnight, allow no one in the home, and trying to escape will put their lives immediately at risk. The vibrant, lush scenery outside of the estate is in stark contrast to the dreary and crumbling condition of the house. This difference is a visual reminder of the two worlds in which the film lives in: the living and the dead. But in this story it's not the living who can't let go of the dead, it's the dead who wont let go of the living. The consequence of this is that the living aren't experiencing life at all, but rather live as prisoners confined to the cursed home with their lives a mirror image of the house they are confined to: still, decaying, and waiting to fall apart. When Rachel meets and has feelings for a boy from the local village, one forbidden love is exchanged for another and the consequences become deadly when the curse is threatened. It's a very smart and layered script that deals wonderfully with the themes of forbidden love and the vastly different scenarios it can come from. The house and film are quiet making every noise something to pay attention to and be cautious of. As the story progresses and the family curse is threatened, the dead grow more restless and aggressive making their appearances more sporadic and abundant. These appearances come with fantastic lighting and makeup that create striking visuals of the dead. Charlotte Vega and Bill Milner both give very strong performances as the orphans. Milner does a great job portraying the broken spirit and already consumed soul of Edward. But it is Vega who shines at the center of the film. She is perfectly cast as Rachel, the seemingly doomed sister who learns she has a dim light of hope left inside her despite the curse she lives under. Vegas eyes are as mysterious, still and dark as the lake that consumed her parents, and their parents before them. And like the lake that casts ripples when disturbed, her eyes flash with life during moments of fear and awakening. She's a haunted and damaged rebel and her performance captures these qualities. The Lodgers is a smart and creepy film with a solid story that is told with patience. It's quiet and effective with strong performances and great locations and set design. 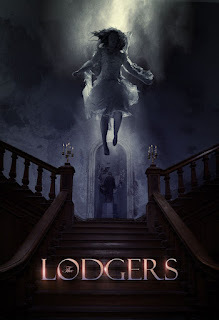 If you like the slow burn and mystery of old school Gothic thrillers with haunted houses and family curses passed down from generation to generation like a hereditary supernatural disease, then a I highly recommend The Lodgers. I'm Jason, a supporter of horror. Overall movie lover & fan of fright. I review as a fan here at The Indie Horror Review and MorbidlyBeautiful.com. Member of the Fright Meter Awards and Film Independent Spirit Awards.